Quick profiles of the breeds that I’m taken with and would consider owning or adopting. In the circles I move in, it surprises me whenever I hear that people still harbor such negative opinions of pit bulls or dogs who resemble the bully breed type. When I volunteered at our local SPCA, some of my friends expressed concern about all of the pit bulls there and asked me if I was afraid of them. And I’d say no, I didn’t have time to be afraid of them, because all of them were spending all of their energy trying to crawl into my lap and lick my mouth. I was surprised. Isn’t everyone on board with pit bulls now? Apparently not. I was also startled, when visiting a beach in Ireland this summer, to see that (really shockingly and stupidly broad) breed-specific legislation was being enforced there. I shouldn’t have been: the United Kingdom and Ireland are on the long list of countries that ban bully breeds. And just a few weeks ago, Montréal joined the list of major cities that aim to ban pit bulls. * (*It sounds like there is an effort to put this on hold? Will be interested to hear how this develops.) Denver and Miami still ban them, and it is plausible to assume that other cities around the world will continue to buy into breed-based discrimination in the name of “safety” and “public order.” There are still very vocal “advocacy” groups hell bent on outlawing pit bulls. How I wish more people and more legislators would read Bronwen Dickey’s excellent book, Pit Bull: The Battle over an American Icon. Dickey approaches the story of the “breed” (more like dog type) with the clear-headed mind of a journalist and historian. She is a thorough researcher and weaves together a variety of subjects, interviews, and studies to explain why we see pit bulls the way we do now. What results is a genuinely fascinating narrative of the ebb and flow of US public opinion regarding this dog. Americans have freaked out about particular dog breeds before — there was a murder campaign over the tiny, innocuous-looking German spitz in the early 1900s (totally surprised to learn about this one), and then, more recently, other German breeds, like German shepherds, dobermans, and rottweilers — but no terror seems to have lasted as long as the one we’ve directed at pit bulls. Pit bulls, Dickey concludes, are just dogs. They are no more virtuous or vicious than any other dog. But we have really caused them to suffer because of our own prejudices. It is a sad thing indeed. 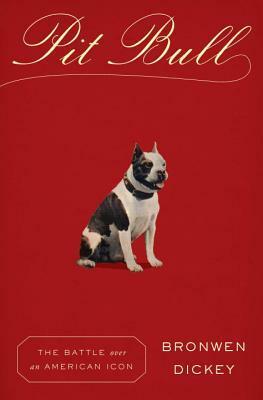 I’d encourage anyone with an interest in canine and human welfare to read this book and to share it with others. Have you read Pit Bull? What do you think? Disclaimer: I was not asked to write this review or compensated in any way. Just really loved the book and wanted to share! Should you get a pug? Or a bulldog? English bulldog. Creative Commons license. Short answer: No. Please don’t. Let’s have a brief and simplistic history lesson of the purebred dog, shall we? Dogs have been around for a long time. When they were bred in the past, they were bred for function. Dogs that were good at herding were bred to other good herders; dogs that were good at hunting were bred to other good hunting dogs. And then you had sheepdogs and hounds. Their appearance probably varied greatly, but they were prized because they could get the job done. But around the turn of the century, eugenics started to become popular. Maintaining the “purity” of races was all the rage (and we remember how that turned out, in the form of Nazi Germany). Victorian England decided to turn its racial purity sights onto their beloved dogs, and they created the Kennel Club in 1873 and with it, the notion of a “pure”-bred dog. Dog shows and an invented breed standard allowed wealthy dog owners to breed their pets into status symbols. Kennel clubs exist all around the world today, and the typical purebred dog is bred to meet a breed standard, determined by a kennel club. This breed standard is determined by the breed clubs, and it is based on a somewhat mythical (and changeable) notion of what the “perfect” example of its breed should look like. Dog shows are strictly beauty pageants. Dogs have to meet an arbitrary, human-defined standard of beauty to be declared fit to be bred. And therein lies the problem. When we make appearance the primary criteria for choosing a dog, we do a great disservice to the health and welfare of dogs everywhere. Genetic diseases skyrocket. Among humans, it’d be gross/totally taboo for a grandfather to procreate with his granddaughter. But in the purebred dog world, this is completely common and even encouraged, especially if that sire is a ribbon winner. Naturally, this makes inherited disease vastly more common. As a weird/gross factoid of how far we’ve taken this, Imperial College London found that the approximately 10,000 pugs in the United Kingdom are equivalent to only 50 genetic individuals. Anatomy gets screwed up to meet a capricious breed standard. Again, the breed standard is completely invented. There is no good reason for dachshunds to have one-inch-long legs anymore. 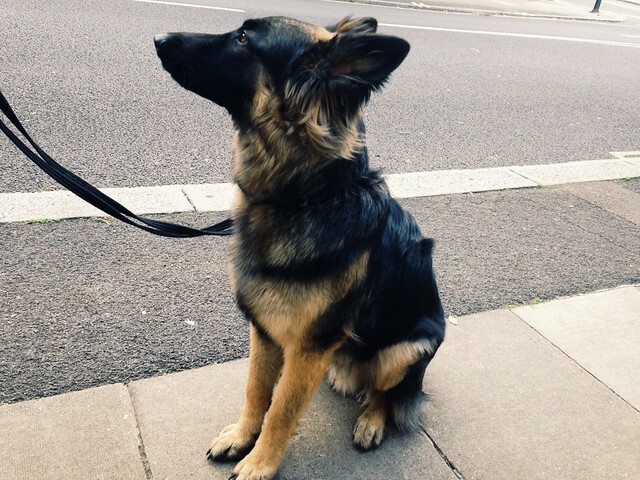 There is no good reason for German shepherds to have back hocks that almost touch the ground. There is no good reason for bulldogs to be unable to respirate normally because of their squashed snouts. The dogs are bred this way to meet a breed standard, which is completely made up. And we are destroying their bodies in the process. Didn’t your mother ever tell you looks don’t matter? It’s what’s on the inside that counts? And what’s on the inside of many purebreds, especially snub-nosed (brachycephalic), breeds is royally effed up, thanks to kennel clubs and breed standards. I always get a lot of hate mail/negative comments when I express this opinion—that bulldogs and pugs are desperately unhealthy and over-bred—but I feel so strongly about this issue that it rolls off my back like water. I also have science on my side, so that helps. If you have a pug, French bulldog, English bulldog, or pekingese, or any extremely over-bred/deformed purebred, I know you love your dog. I know your dog loves you. They’re little fighters. They suffer and they don’t complain. I know it’s not directly your fault that your dog can’t breathe or reproduce naturally. It’s the fault of generations of eugenics inflicted on canines to fit a wholly arbitrary breed standard. French bulldogs. Creative Commons license. But what is terrifying and depressing now is how registrations of brachycephalic dogs have soared over the past decade. Pugs and bulldogs are extremely trendy right now. They appear in tons of marketing and ad campaigns, and it’s “hip” to have a dog with a squashed face, especially in big cities. French bulldogs and pugs are small and relatively “lazy” (largely because they are incapable of too much exertion because of their anatomy), and so they appeal to many city dwellers. I see so many pugs and bulldogs on the street, and I feel crushed a little every time I do. If you even know the slightest bit about canine anatomy, you can observe how much these dogs labor and struggle to even walk or trot short distances, especially on hot days. My hair stylist’s 5-year-old English bulldog dropped dead in the park one summer day because his heart simply gave out. Her vet said she’d seen it happen multiple times with bulldogs. I grow sad when I hear owners laughing about how their pugs or bulldogs “snore” or grunt so much. It isn’t really funny; your dog snores so loudly because she actually can’t get enough air. It’s heartbreaking. Dogs deserve better than this. So, what are you to do, if you really like the look of pugs or French bulldogs? Here are a few ideas. Puggle. Pug + beagle = dog who can breathe! Pit bull or pit-type dogs. Still the squashed face that may appeal to you, but a much healthier build. And there are TONS of wonderful, happy pitties in shelters all around the country who are desperate to find happy homes. Any mixed breed! Really. Breed is not a great determinant for personality. And modern purebreds, especially brachycephalic purebreds, tend to be genetic disasters. A pit bull-type dog. Creative Commons license. But it’s time we spoke up for purebred dogs, who can’t speak up for themselves. Start demanding better breed standards from local breed clubs. Urge the kennel club in your country to take stronger measures to ensure that dogs are healthy and free of genetic disease. The most important thing is to resist the urge to buy a puppy that’s bred to extremes. If we stop demanding snub-nosed breeds, the supply will decrease. Just say no to pugs and bulldogs. After all they give us, dogs deserve better, healthier, longer lives. And we have the power to give it to them. An important question for anyone with a dog to ask is, What is my dog’s genetic heritage? In other words, what was my dog bred to do? Knowing what your dog was bred for is a helpful way to learn what activities will best engage your dog. And all dog breeds, believe it or not, were created to serve a function. We often lose sight of this in our 21st-century approach to dogs, in which the majority of purebreds are created for (a) their looks, based on rather arbitrary breed standards, and (b) for companionship. But many breeds still retain their instincts to work and fulfill specific purposes. Some breeds’ functions are (etymologically) much easier to guess than others. 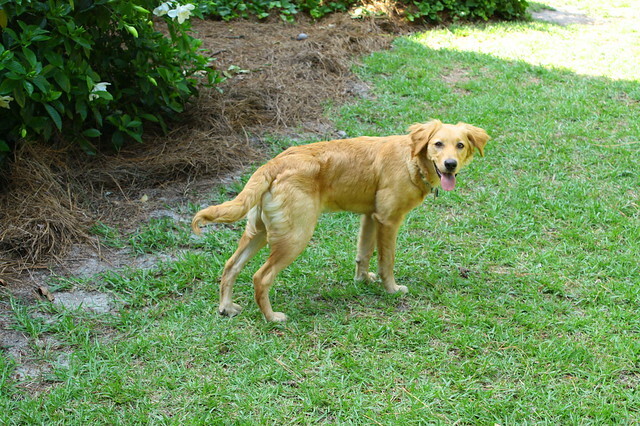 For instance, retrievers were bred to… retrieve. Shepherds were bred to herd sheep. Sighthounds (greyhounds, whippets, borzois, etc.) were bred for their keen vision in and speed in chasing small game. Other breed names have become misnomers because of ruinous breeding practices. Your modern bulldog, for instance, is certainly incapable of baiting any bulls (much less walking down a sidewalk without having difficulty breathing). Even if you have a mixed-breed dog, you can probably make some educated guesses, based on your dog’s interests. Does he love to bark and chase and corral moving objects, people, or animals? He could have herding heritage. Is she obsessed with smelling everything? She might have some hound in her background. Does he adore digging holes? You might have a terrier type on your hands. Horand von Grafrath, Stephanitz’s model for the German shepherd. Shortly after the creation of the breed, Stephanitz founded the first schutzhund (protection dog) club, which is still in existence today. From his model, shepherds have a lineage of herding (believe it or not) and protection (whether of people or property) and working very closely with humans. Stephanitz wanted a dog that looked like a wolf but unlike a wolf, was highly motivated to work with people. Today, German shepherds are most commonly seen in the public eye working with law enforcement, military branches, search and rescue, bomb and drug detection, and cadaver search, just to name a few. 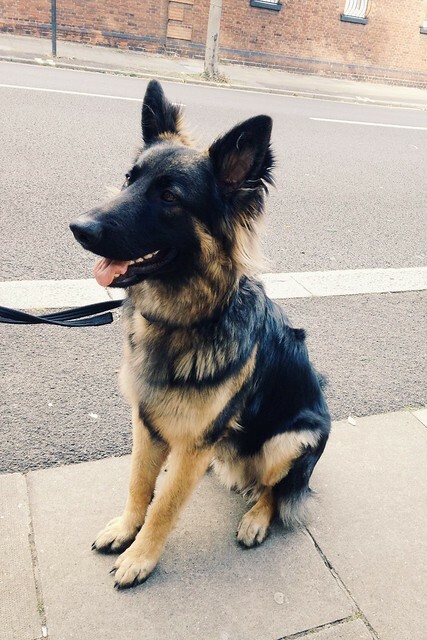 German shepherds are a strong, intelligent, sensitive, versatile, and demanding breed, and therefore, they can be a big pain for us normal people who decide to keep them in their homes. If you’re not going out every day and searching for bombs with your shepherd, how else can you keep her happy and busy? Here are some ideas. This is not exactly a canine sport, but I think free time with other dogs is especially vital to the health and well-being of a German shepherd. Eden and Pyrrha with Loki, a Newfoundland. 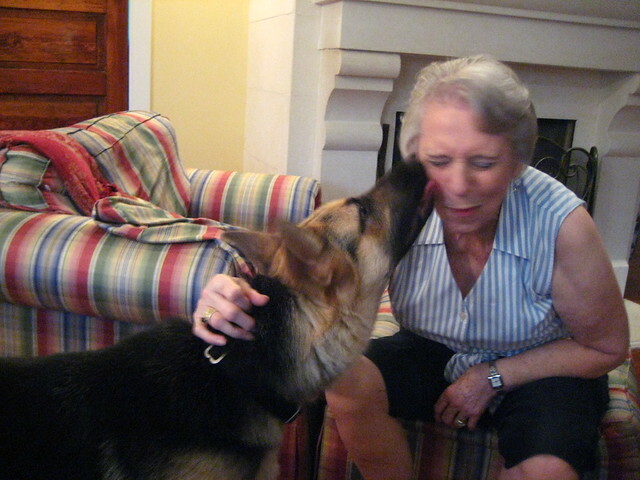 Like many intelligent and observant breeds, GSDs have a tendency to be touchy. If they are not socialized throughout their lives (particularly when they are puppies), their ability to get along with other dogs can be seriously undermined and lead to unchecked territorial behavior and anxiety-induced aggression. 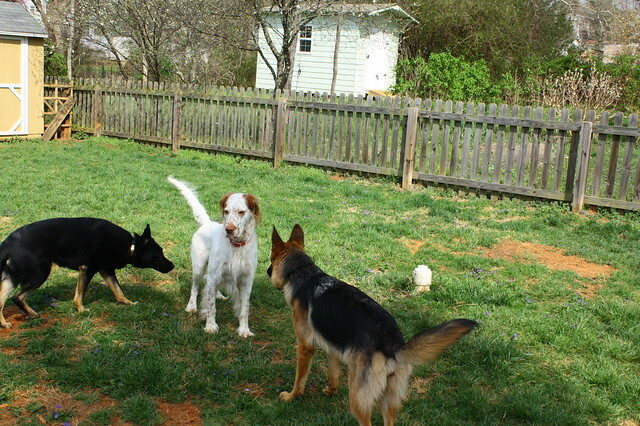 Josie, a working-line GSD; Finn, a Llewellyn setter; and Eden. If you have a fenced-in yard like we do, invite other stable dogs that you know and like over for a play-date. If you don’t have a fenced-in yard, try to find a secure area for your dog to interact off leash with other dogs. I personally find dog parks a little risky, but if you have one nearby that you like and trust, go for it! I think this activity is one of the most important for our shepherds. Schutzhund is a German dog sport that was initially created as a suitability test for German shepherds. Today, all breeds can compete (although the field tends to be dominated by GSDs, Belgian malinois, and other large, working breeds) and the sport tests a dog’s ability to serve as a protection dog. 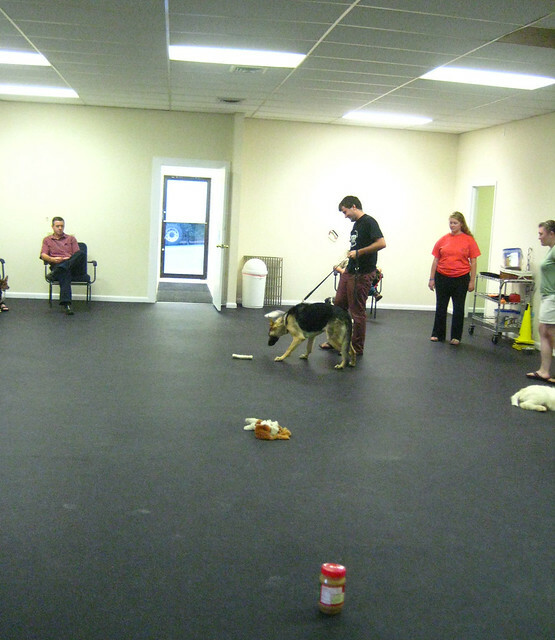 Schutzhund competitors have to perform a series of tasks related to tracking, obedience, and protection. Schutzhund practice in the US Navy. Also, this dog is a malinois, but you get the idea. Creative Commons license. Eden’s parents are both West German imports, and accordingly, both were titled in schutzhund. Her father, impressively, had achieved the Sch3 title (the “master’s degree”), which I think partially explains why she’s so intense all the time. Ha. Schutzhund is not personally appealing to me, but I know that many greatly enjoy the sport and the bond that they develop with their dogs through it. Yes! There is a resurgence of interest in German shepherds going back to their roots and herding sheep. © Mark Härtl, Flickr. Creative Commons license. 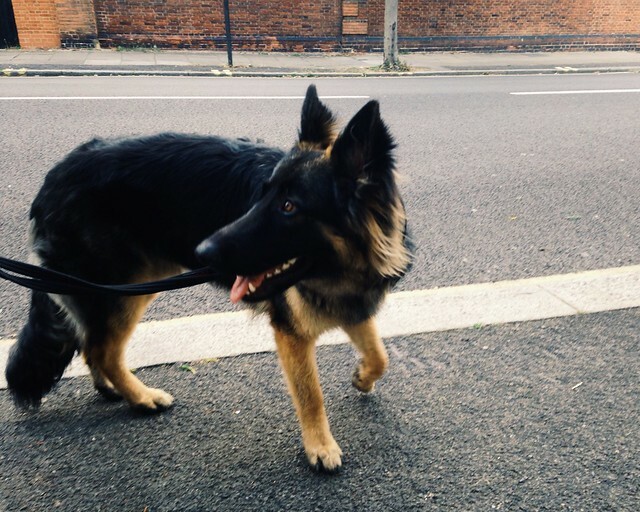 It takes a bit more effort and dedication to train a GSD to herd than it might for the typical border collie, but it is possible, particularly if your dog has a working lineage and the proper temperament. To get started in herding, you would want to have your dog assessed for herding instinct by a herding trainer in your area. I think Eden could be a capable herder if we ever wanted to try. Pyrrha’s hunting instincts are too strong, I think, for her to overcome, and she is also not very confident in general. But it’s certainly a sport I’ve thought about for Edie. Nose work refers to trials in which dogs essentially play hide and seek with smells. 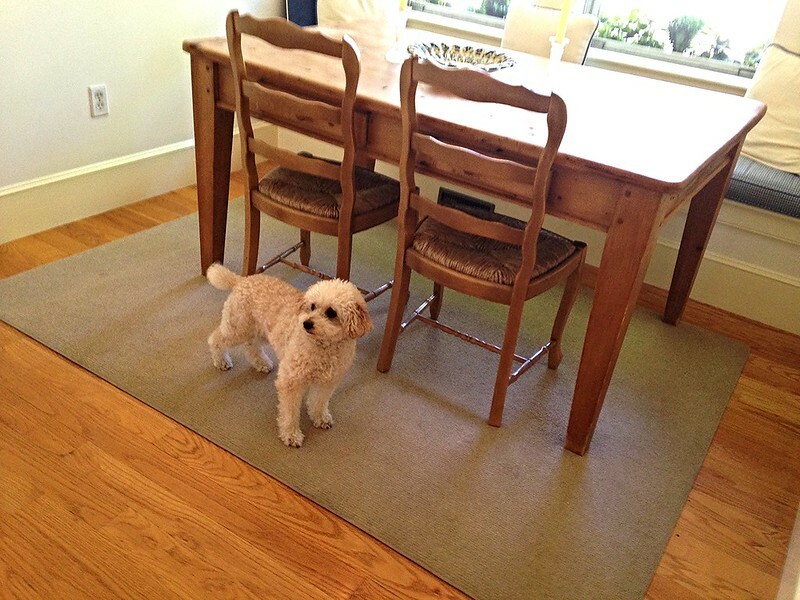 It can be a great confidence builder, especially for shy dogs. A terrible photo of Pyrrha in class. Pyrrha is very scent oriented, and I’ve thought about taking some nose work classes with our trainer, who offers a few levels of this canine sport. She is a shy butterfly, and I’ve love to see her excel at a sport that was just her speed. Shepherds can be great disc dogs, as our little Eden has shown us. Eden LIVES for the Frisbee. It is the only thing that matters in her life. If your shepherd has a fit build and an interest in chasing and retrieving objects, you have a Frisbee dog on your hands! For more about teaching your shepherd how to catch (and return!) flying discs, see my post about how to train your dog to be a disc dog. Your GSD may never be an agility all-star like a border collie, Australian shepherd, or Jack Russell terrier, but it can be a perfect canine sport for the active and motivated shepherd. © John M (2007), Flickr. Creative Commons license. 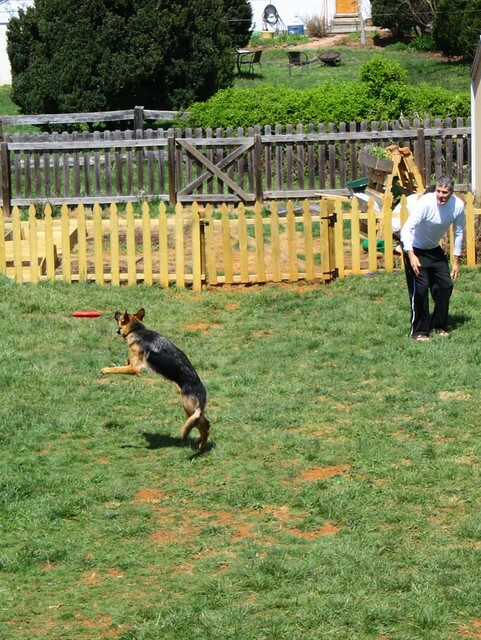 Again, because of her Frisbee-related jumping skills, I think Eden could really enjoy and excel at agility. I may have to coerce my husband to build us some little jumps to practice with in the backyard. Do you have a particularly gentle, people-oriented shepherd? If so, consider therapy dog certification. 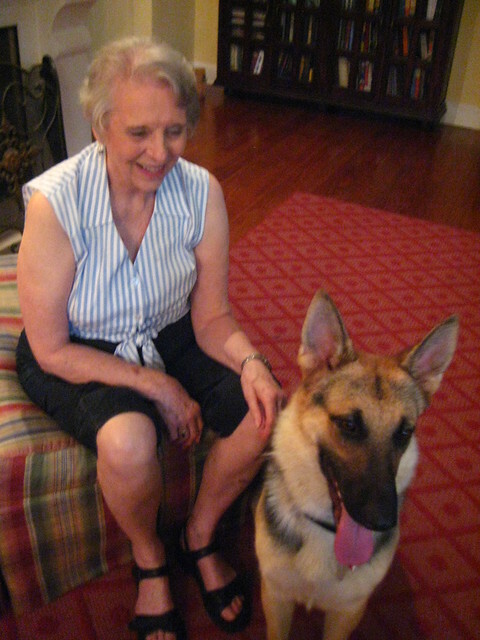 Pyrrha with my beloved late grandmother. I think therapy dogs are some of the most beautiful and touching examples of how species can care for one another, and dogs are uniquely designed to lavish affection on people. Therapy dogs can serve a wide range of people and needs, and I am constantly impressed by their versatility. Pyrrha is a gentle dog, but she is truthfully not a great candidate to be a therapy dog (probably because she still needs so much therapy herself), but under the right circumstances, she is extremely sweet with people, especially with the elderly. These are just a few of the many, many activities that shepherds can enjoy, based on their lineage. It is a pleasure to have dogs who are so willing to work with people and learn new things. How do you keep your dog active and engaged, based on his or her genetic heritage? Heart all a flutter! 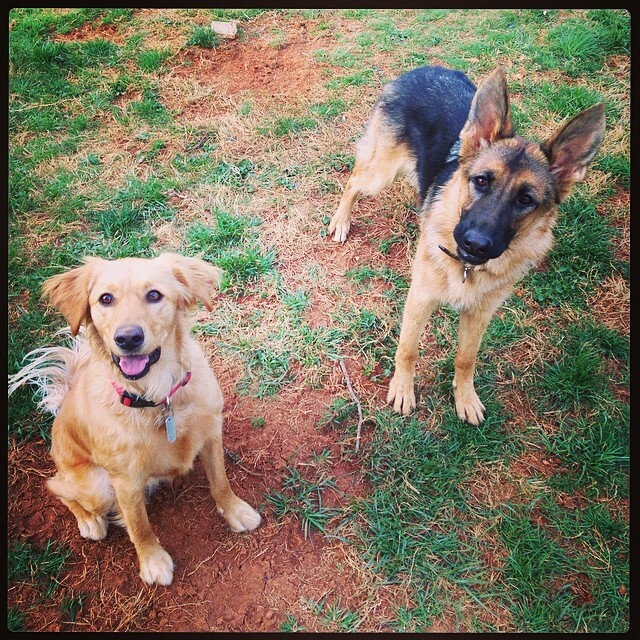 I said, “Your dog is beautiful,” and he smiled, and I responded that we had two German shepherds at home. It’s always a good “in” if you want to pet a shepherd, which is not something that I generally ask, but bereft of P and E for the summer, my dog-craziness has reached unsustainable levels. He kindly replied that we could, and his dog sniffed me gently and let me pet him for a bit. The man told us that the shepherd was 9 months old and from a West German imported line. “I’m pretty fit,” he told us, “but he makes me look like a slob.” German shepherds will do that to you! The dog was beautifully calm and very attentive to his person. He was also heeling very nicely, and I was pleased to see that he didn’t have a very exaggerated back end, which always makes me happy. It’s always nice to meet a stable, young breed ambassador. Live long and prosper, British German shepherd pup! Are you similar to your breed’s fans? I am perpetually interested in how certain personality types gravitate toward certain breeds or breed types. For instance, I have always loved dogs in the herding group most. I love their look, their intensity, their intelligence and drive to work with people. I grew up with a beautiful Australian shepherd, and I dream sometimes about getting an English shepherd. But I also have a soft spot for sighthounds and spaniels. © Mike Hale (Flickr). Creative Commons license. And yet I feel very different from the typical German shepherd person. Allow me to stereotype, will you? Clearly, not everyone who has a shepherd fits most or even one of these stereotypes, but I find these traits to be more true of shepherd people than of other groups aligned with other breeds. 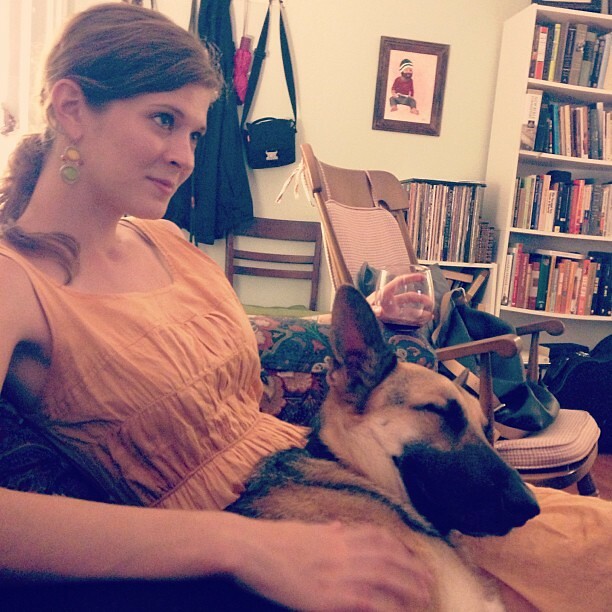 This person loves his or her shepherd as much as I love mine, and the generalizations are not meant to discount that but rather to say I often feel very, very temperamentally different from the typical German shepherd owner. I am not tough, and I am not impressed by machismo. I do not and never will own a gun. I follow the science-based philosophies of positive reinforcement training and would never use a shock collar on my dog or on any dog. 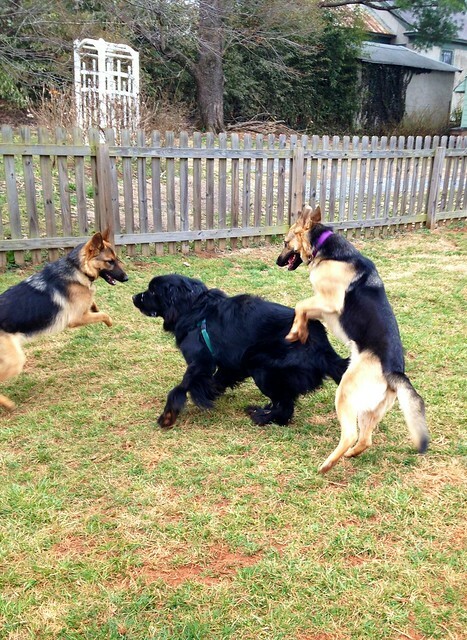 I do not think my dogs are trying to “dominate” me, a concept I find simultaneously laughable and dangerous. 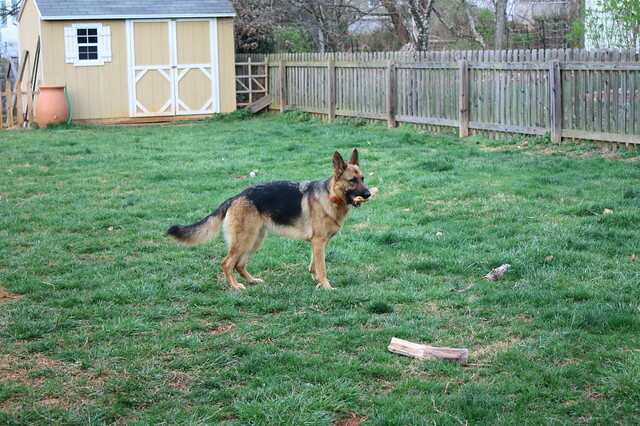 For these reasons, I stay off the German shepherd message boards and have honestly distanced myself from a lot of our dogs’ rescue representatives, most of whom have bought into a shock-collar “training” franchise and encourage adopters to put their shepherds through their expensive programs, which promise fast results for “problem” dogs by the widespread use of e-collars. I’m OK with being an outsider. Draco, one of our fosters, and me. It makes me curious, though, about other breeds, so I’d love to hear from you. What are some of the stereotypes of people with your dog’s breed? Do you fit those generalizations? I can’t remember where I read this, a tidbit in one of those dozens of dog books I devoured, but it was a line to the effect that “poodles, more than other breeds, have a sense of humor.” It’s one of those entirely unprovable statements that I have decided to take as truth. I’m thinking it was probably Stanley Coren, because it sounds like the kind of thing he’d say, but the point was that poodles enjoyed practical jokes and liked playing tricks on their humans. Who can even say if this is even remotely true, but I like believing it, and I have harbored a fondness for poodles (especially standard poodles) ever since. We flew from London to Boston this past weekend and were kindly provided housing for a night in the charming town of Hingham. 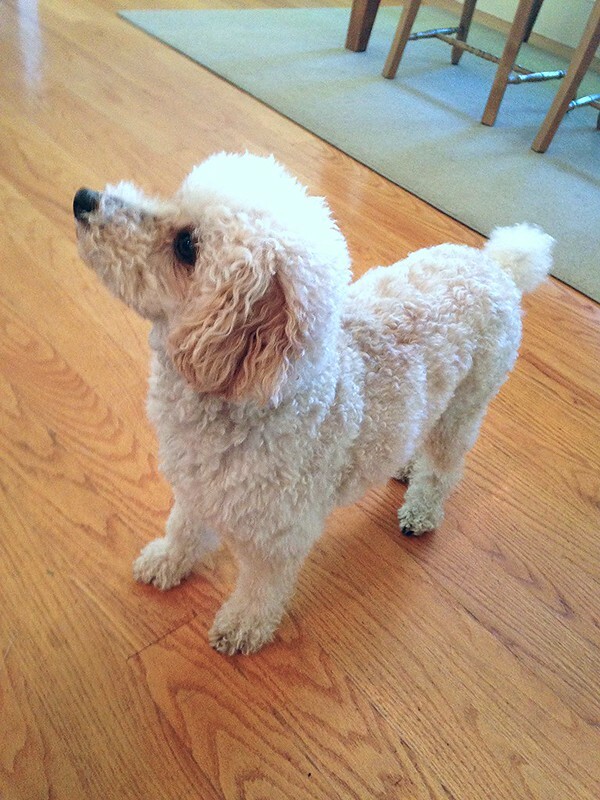 Louie, a miniature poodle, was one of our hosts. Louie, at his human mother’s admission, is a very sensitive dog. 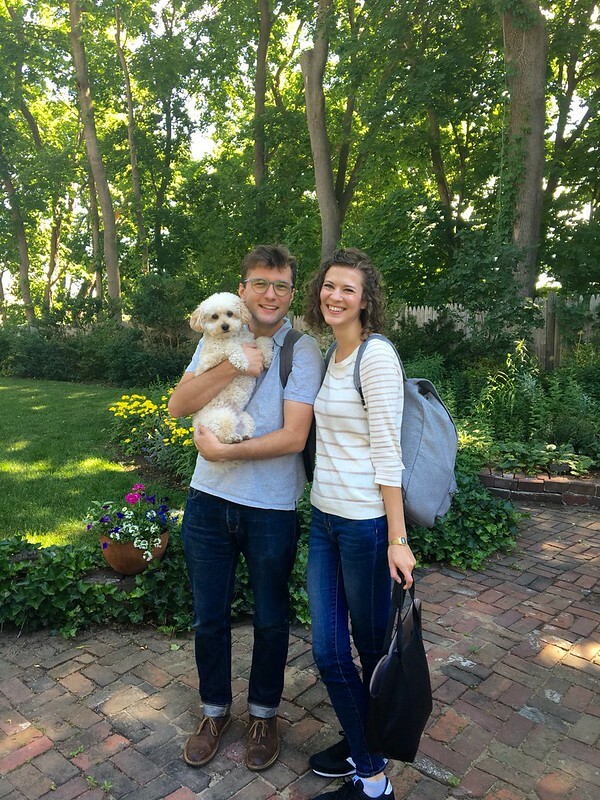 She says that unlike their previous dogs—labs and golden retrievers, who preferred lying around with dazed expressions—Louie gets up from his throne and sits near his people and seems to be listening to their conversations. He watches his human’s face with deep concentration, and I dare say, anthropomorphically, he had such a human expression on his little fluffy face. My husband agreed, saying that our dogs look so much like dogs (i.e., wolves). Their happy faces are dog-happy faces, and their intense faces are dog-intense faces. But Louie? His happy face seemed to be a human-happy face. I know this is all crazy-pants, but these are the kinds of things that run through my head when I am with dogs. Do you think that certain breeds approximate human emotions more than others?